eLearning Industry‘s latest listing of the ‘Top 20 LMSs based on Customer Experience‘ ranks CrossKnowledge Learning Suite at number 11. This Top 20 LMS list has been planned following a holistic approach based on input from actual users who were willing to share their experience with the Learning Management Systems. The reviews have been verified one by one by eLearning Industry. CrossKnowledge Learning Suite scored an impressive 86% in Customer Satisfaction, 92% in Customer Effort and 88% in Customer Expectations, with a total score of 82. “Over the course of the year, CrossKnowledge Learning Suite has advanced a lot. 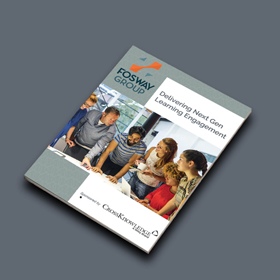 Our innovative and engaging learning experiences deliver results, and that’s our ultimate goal. With the recent addition of the Facilitator Interface in CrossKnowledge Blendedˣ, and our customers loving our platform, we are sure we are on the right track.” said Danish Khan, Product Marketing Manager at CrossKnowledge.